Recently, there has been a lot of conversation in the Rainbow Six Siege community on whether the one-shot headshot mechanic should stay in Siege. From pro players to YouTube creators, everyone is weighing in on the discussion. There is a lot to consider when talking about removing a core mechanic from a game and even more to consider when that game is an esport. The wide variety of variables Siege gives players to deal with at any moment is unique to the game. Perhaps the most important, and most frustrating, variable is the one-shot headshot mechanic in Siege. It’s impossible to track the number of times players have been taken down by a lucky headshot through a wall, or times pros get decapitated by a stray round that wasn’t even meant for them, but does that mean that the mechanic should be eliminated? No, and let’s talk about why. Tracing Rainbow Six Siege back to its reveal, Ubisoft initially planned on the game having a heightened sense of realism. You can see the reveal trailer here. Aside from the cringey player dialogue, Siege looked to have a pretty grounded feel. There were no crazy Finka boosts and no Evil Eyes shooting lasers at players—just a SWAT team and some generic-looking terrorists. While the finished product is better for having ditched some of the realism, the one-shot headshot mechanic is one aspect of realism that has helped make Siege into competitive game with a unique spirit. Given the one-shot headshot mechanic has been in Siege since its launch, removing the mechanic isn’t viable change for the devs to make. YouTube creator Matimi0 mentioned that if players had an issue with the mechanic at launch, then maybe he could see it happening, but Siege is too deep in its life cycle now for the change to be a possibility. The changes Ubisoft would have to make would involve fundamentally revamping the mechanics of the game and guns. G2 professional player Niclas “Pengu” Mouritzen has also voiced that he would like to see the one-shot headshot mechanic removed from the game, but only for certain guns. While Pengu has a point about which guns are capable of one-shot headshotting, the balancing issue still remains prominent. Siege is already a tricky game to balance. Not only do devs have to think about the massive amount of guns in the game, but they also have to make sure guns are in balance with each operator’s special ability. Siege just happens to be built in a way that doesn’t allow for such massive changes to be carried out at the whims of its fanbase and nobody wants another Operation Health. There is also the issue of players having to essentially re-learn to play the game, according to Matimi0. The creator brings up a great point here, as the removal of one-shot headshots would completely change the gameplay of Siege. Removing the mechanic would give players more freedom to run around the map and hip fire their way to victory. While there is an appeal to run-and-gun type of gameplay, the playstyle goes against what makes Siege special, and asking longtime players to completely re-learn how to play the game is too tall an order. Changing the headshot mechanic would not only hurt the fans who have been around from the start, but it would also greatly take away from the high-stakes gameplay that revived Siege from the dead to make it a massive esport. The one-shot headshot mechanic keeps players on their toes and gives the game a unique intensity that not many other games can achieve. As Rogue 9 pointed out in a reply to Pengu, the goal for every player is to win gunfights without taking damage. Losing health in Siege can be the defining factor in how the end of the match plays out, and allowing players an avenue to save health by preying on an off-guard opponent is often crucial to how matches swing. @G2Pengu The benefit is that the 1HK mechanic allows players to win gunfights without losing health themselves. With only 1 life and without regen in the game, losing part of your health on engagements becomes an issue. Other than that, hell yeah insta death is always frustrating. Are there really any other games like Siege? The game isn’t the greatest creation ever by any means, but Siege does hold a special place in the pro scene and in the consumer market. While the game continues to grow, Siege still maintains its learning curve for new players. Maybe the reason why this conversation is blowing up is because players who are new to Siege are finding it a bit too difficult a switch from the gameplay of CoD and Battlefield. It isn’t that CoD and Battlefield are easier, but they are totally different games with different gameplay mechanics, and even then the two games are vastly different from each other. 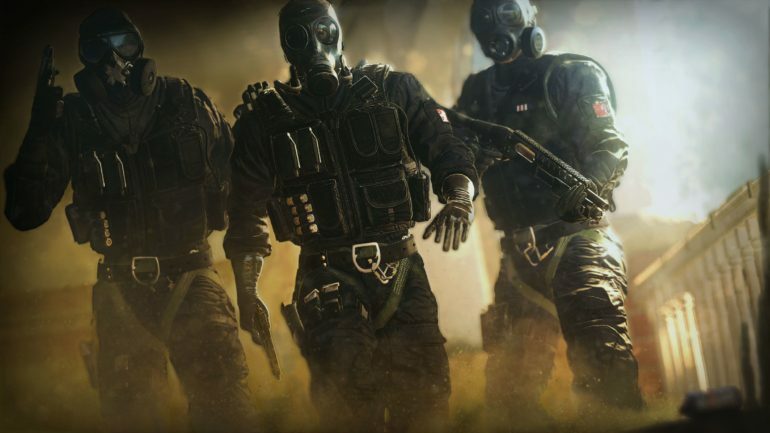 Ubisoft has a clear agenda of getting over 100 operators in Siege before it wraps, and is already supporting new seasonal events like Operation Outbreak and Rainbow is Magic, so chances are unlikely that they would put their promises to the side in order revamp one of the most important mechanics in Siege. Overall, the argument to remove one-shot headshots from Siege is a fair one with good intentions, but the change would come at too great a cost to almost every player. Even if the fanbase fully backed the change, it would still be an issue from a development standpoint. If there is any concrete comment from Ubisoft on the topic we’ll be sure to let you know. Until then, let’s keep talking about the one-shot headshot issue and tackle it together as a community.